Kyrie Irving, Cleveland Cavaliers point guard, unfortunately fractured his left kneecap in game one of the NBA Finals vs. the Golden State Warriors. 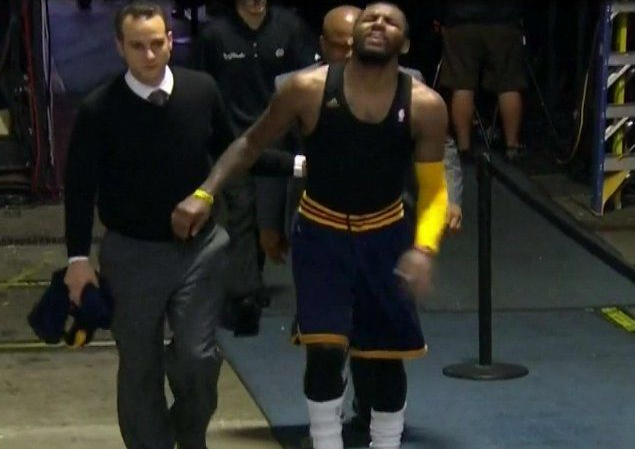 He will miss the remainder of the finals with an estimated recovery time of three to four months. Golden State won the game 108-100. From a body language perspective, whenever anyone is in significant physical pain or emotional pain, their central forehead will be contracted and elevated as Irving's is here. It's extremely important that there's a simultaneous congruent mouth expression as well (also displayed by Irving). If a person claims they are in moderate to severe physical pain and their central forehead is not contracted - they are feigning. Irving has the contributing emotional factor of knowing he will miss the rest of the 2015 NBA finals - and not be able to help the city of Cleveland win their first major sports title since the Browns in 1964.